Seen after we left the British Museum. Initially we were heading down New Oxford Street. I wasn’t sure which way Tottenham Court Road Underground Station was, so ended up going via Centre Saint Giles onto High Holborn (then found our way to Holborn Underground Station). Was probably better to go there, as only had to get two tube trains back to Victoria. This is the Office Building of the Central Saint Giles complex in the London Borough of Camden. The 11-floor building has a height of 49 m (162 ft) and a floor area of 39,901 sq m (429,491 sq ft). The horseshoe-shaped building encircles a publicly accessible courtyard. 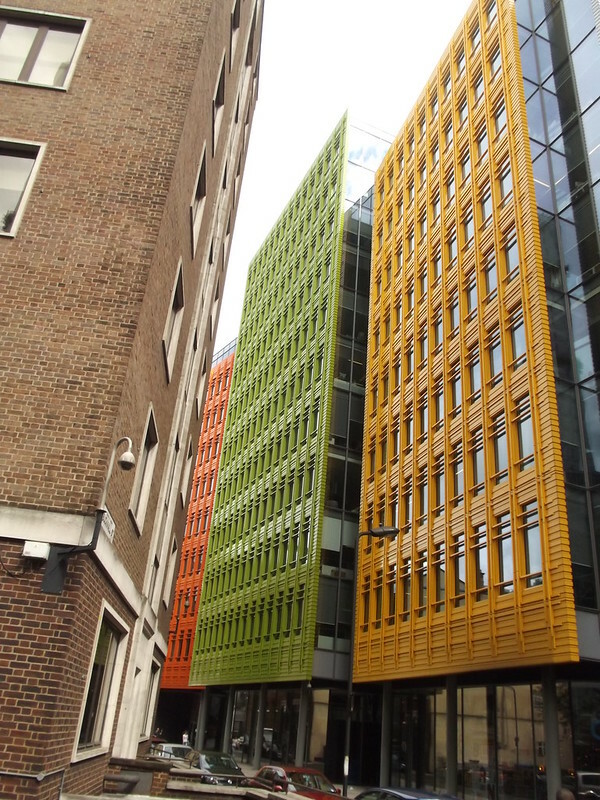 Central Saint Giles was designed by Renzo Piano and was constructed from 2007 to 2010 at a cost of £450,000,000. The buildings’ exterior facades are covered by glazed tiles in green, orange, lime, yellow, and grey. The complex has received a BREEAM rating of "Excellent". Image published by ell brown on 2015-09-01 20:15:35 and used under Creative Commons license.